Citation: Shen XM, Peng K, Zhang X, et al. Research on Simultaneous Electrochemical Oxidation-Assisted Polishing of Reaction-Sintered Silicon Carbide by Ceria Slurry. Res Rev Electrochem. 2016;7(2):101. Electrochemical oxidation is introduced in the machining of reaction-sintered silicon carbide (RS-SiC) ceramic by combination with abrasive polishing. Through treating the ceria slurry as the electrolyte and the abrasive, the simultaneous electrochemical oxidation-assisted polishing (S-EOAP) can be realized, which can obtain high material removal rate (MRR) and smooth surface quality at the same time. The S-EOAP experiments were conducted in 8 groups with different conditions. The polished RS-SiC samples were detected by scanning white light interferometer (SWLI) to evaluate the surface quality, and further investigated by the scanning electron microscope (SEM) to analyse morphologies of the polished surface. The experimental results indicate that surface qualities of the polished sample are determined by the cooperation of oxidation potential, slurry concentration, and load. The study on S-EOAP can improve the process level of RS-SiC samples and promote the application of RS-SiC products. Electrochemical oxidation is introduced in the processing of reaction-sintered silicon carbide (RS-SiC) ceramic , which aims to increase the material removal rate (MRR) and improve the surface quality by combination with abrasive polishing. RS-SiC is a promising mirror material for the space telescope system , because it has excellent physical, mechanical, chemical, thermal, and electrical properties, such as the high specific stiffness, high bending strength, good size stability, high radiation resistance, low thermal expansion coefficient, high thermal conductivity, and an inexpensive manufacturing cost [3-5]. Thus, processing RS-SiC is focus of research in the optical and ceramic fields . Oxidation-assisted polishing (OAP) has been developed to explore novel technique for the efficient process of RS-SiC , because RS-SiC is a classical difficult-to-machine (DTM) material for its high physical hardness and chemical inertness . The fundamental mechanism in OAP is the combination of oxidation of the hard substrate and removal of soft oxide [9,10]. Among these developed oxidation methods, such as thermal oxidation [11,12], plasma oxidation [13,14], electrochemical oxidation [15,16], and ultraviolet irradiation , rate in the electrochemical oxidation of RS-SiC can reach 5.3 nm/s calculated according to Deal-Grove model [18,19], which is largest among those in present oxidation methods. Thus, simultaneous electrochemical oxidation-assisted polishing (S-EOAP) is considered as an efficient method to obtain high MRR and smooth surface quality in machining RS-SiC. Ceria slurry was treated as the electrolyte and the abrasive in this study. Oxidation of the RS-SiC substrate and removal of the oxide layer was conducted simultaneously. The processed RS-SiC sample was detected by the scanning white light interferometer (SWLI) to evaluate the surface quality, and further investigated by the scanning electron microscope (SEM) to study morphologies of the polished surface. In this way, the feasibility in processing RS-SiC by S-EOAP was validated. Schematic diagram of S-EOAP system  is shown in Figure 1. The S-EOAP system could be divided into two parts: electrochemical oxidation part and abrasive polishing part. The electrochemical oxidation part included a digital storage oscilloscope (DSO), digital function generator (DFG), high speed bi-polar power supply, cathode (Pt), anode (RS-SiC sample), electrolyte (ceria slurry), and some connect wires. Meanwhile, the abrasive polishing part consisted of stage, polishing pad, abrasive (ceria slurry), motor, fixed plate, ball spline, pulley and belt, load plate, weight (can be adjusted), fulcrum, counter weight, and some joints. The RS-SiC sample was fixed on the stage, which could realize 2-dimensional motions by the driving motors. Surface of the RS-SiC sample which contacted the slurry was oxidized by the potential, and the oxide layer was removed by the polishing pad. 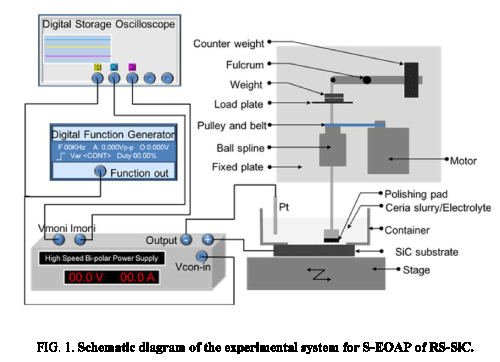 Figure 1: Schematic diagram of the experimental system for S-EOAP of RS-SiC. For the purpose of investigating the relationships between surface quality of the obtained RS-SiC sample and the different experimental condition, the experiments in 8 groups were conducted, and the summarized experimental parameters were shown in Table 1 . The oxidation rate of RS-SiC sample was determined by the oxidation potential, electrolyte concentration (ceria slurry concentration), and the MRR of oxide layer was decided by the ceria slurry, load, particle size, polishing pad size, rotation speed, and scanning speed. The processing time was 1 h for the experiments from 2 to 8, except that in experiment 1 was 3 h. After machining, the processed RS-SiC was detected by SWLI and SEM. Table 1: The summarized experimental parameters in S-EOAP of RS-SiC. Evaluations of surface qualities of the processed RS-SiC samples were shown in Figure 2, which were obtained by SWLI measurement. They can be found that under different process conditions, the surface qualities of the obtained RS-SiC samples differ, which are determined by the relationships between the oxidation rate of RS-SiC sample and the removal rate of oxide layer. Figure 2: Evaluations of surface qualities of the processed sample in S-EOAP of RS-SiC. 1) When the oxidation potential, concentration of ceria slurry, load was low, such as experiment 1, which indicated a low electrochemical oxidation rate of RS-SiC substrate and a low frictional removal rate of oxide layer, there were few protuberances or cracks on the processed RS-SiC sample, and the obtained surface rms and Ra roughness were 2.143 nm and 1.552 nm, respectively, as shown in Figure 2a. Although smooth surface quality could be easily obtained in this condition, the equivalent MRR in this S-EOAP process was low. Meanwhile, the obtained surface quality in this S-EOAP process was worse than that obtained in thermal oxidation-assisted polishing or that obtained in plasma oxidation-assisted polishing [11-14]. Therefore, this group of parameter was not suitable for rapid processing of RS-SiC sample with high MRR. 2) When the oxidation potential was low and the load was high, such as experiments 2, 3, and 4, which indicated a low oxidation rate of the RS-SiC substrate and a high removal rate of the oxide layer, surface qualities of the processed RS-SiC samples were changing better along with the increasing of concentration of the ceria slurry, and the obtained surface rms roughness was 4.920 nm, 5.121 nm, and 5.300 nm, respectively. Similar with quality of the over-polished sample in the divided electrochemical oxidation-assisted polishing (D-EOAP) of RS-SiC , the combination of low oxidation rate and high removal rate could obtain a surface roughness RMS around 5 nm, and equivalent MRR in this S-EOAP process was also low, which indicated that these groups of parameters were also not the optimal. 3) When oxidation potential was high and the load was low, such as experiment 5, which indicated a high oxidation rate of the RS-SiC substrate and a low removal rate of the oxide layer, the S-EOAP process was equal to polish oxide SiO2 by ceria slurry. On the one hand, the polishing of SiO2 by ceria slurry could obtain an ultra-smooth surface easily . On the other hand, the generated oxide layers could not be removed entirely, so cracks in the subsurface oxide layers could not be removed, which would result in a rough surface. The actual result was compromise of the two effects, and the obtained surface RMS roughness was 3.836 nm. Hereby, these groups of parameters were also not suitable. 4) When both the oxidation potential and the polishing load were high, such as experiments 6, 7, and 8, which indicated a high electrochemical oxidation rate of RS-SiC substrate and a high frictional removal rate of the oxide, the equivalent MRR in this S-EOAP was high. Although both the oxidation rate and removal rate could be increased along with the increasing of concentration of the ceria slurry, the increasing speed of the removal rate was larger than that of the oxidation rate, which resulted in worse surface qualities along with the increasing of concentration of ceria slurry. The obtained surface qualities in experiments 6, 7, and 8 were 4.416 nm, 7.707 nm, and 13.166 nm, respectively. It can found that experiment 6 had obtained a smooth surface quality and high MRR simultaneously, which proved that this group of parameter was the optimal one in the S-EOAP of RS-SiC in this study. 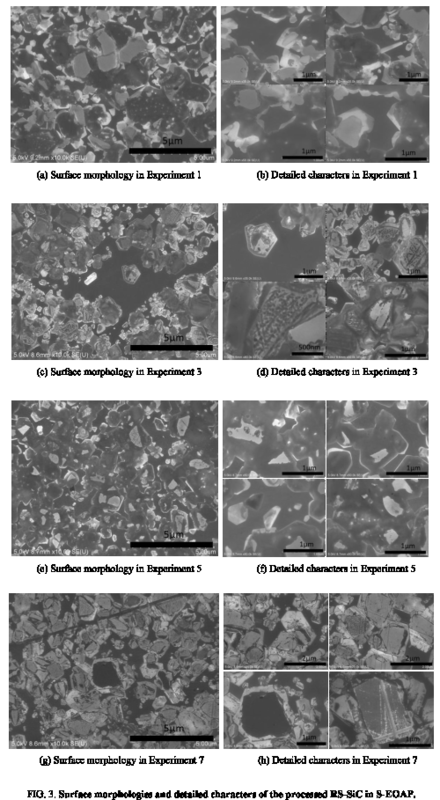 Afterwards, the processed RS-SiC samples in experiments 1, 3, 5, and 7 were investigated by SEM to study the surface morphologies and detailed characters, and the results were shown in Figure 3. It can be found that low oxidation rate of the RS-SiC substrate and low removal rate of the oxide layer was propitious to obtain high surface quality, and there were few cracks or scratches on the polished surfaces, as shown in Figure 3a and 3b. When the oxidation rate was low and the removal rate was high, there would be scratches on the polished surface, as shown in Figure 3c and 3d, which was similar with the over-polishing results in D-EOAP of RS-SiC . On the contrary, when the oxidation rate was high and the removal rate was low, there would be residual oxides on the polished surface, as shown in Figure 3e and 3f, which was similar with the Insufficient-polishing results in D-EOAP of RS-SiC . When both the oxidation rate and removal rate were high, the relationship between them two should be strictly controlled. Otherwise, there would be scratches on the processed RS-SiC sample when the removal rate of oxide layer was larger than the oxidation rate of RS-SiC substrate. Figure 3: Surface morphologies and detailed characters of the processed RS-SiC in S-EOAP. Feasibility in the S-EOAP of RS-SiC was primarily validated in this study. The results indicated that through controlling the electrochemical oxidation rate of RS-SiC substrate and the frictional removal rate of the oxide layer, the high MRR and smooth surface quality could be obtained simultaneously. During the 8 groups of experiments, when the oxidation potential, concentration of the ceria slurry, and polishing load were 10 V, 0.1 wt %, and 100 g, respectively, which indicated a high electrochemical oxidation rate and a high removal rate, high MRR would be realized and smooth surface roughness RMS 4.416 nm was obtained in the experiment 6. Meanwhile, when the oxidation rate of RS-SiC substrate was equal to the removal rate of oxide layer, there would be no residual oxide on the polished surface. Furthermore, there would be few scratches, cracks, subsurface damages, residual stresses on the optimal processed RS-SiC samples in S-EOAP. From this study it could be concluded that S-EOAP was an efficient method to process RS-SiC. The research on the S-EOAP of RS-SiC can improve the process level of RS-SiC samples and promote the application of RS-SiC products in the optical and ceramic fields. This work was supported by a grant from National Key Research & Development Program (Grant No. 2016YFC0802903), a grant from National Natural Science Foundation of China (Grant No. 51505498), and a grant from Natural Science Foundation of Jiangsu Province (Grant No. BK20150714). The authors also express their gratitude to the staffs and students of the Research Center for Ultra-Precision Science and Technology of Osaka University. Woon WS, Hutagalung SD, Cheong KY. Characterization of anodic SiO2 films on p-type 4H-SiC.Thin Solid Films. 2009;517:2808-12. Johnson JS, Grobsky K, Bray DJ. Rapid fabrication of lightweight silicon carbide mirrors. Optomechanical Design and Engineering. ProcSPIE. 2002;4771:243-53. Lee SP, Shin YS, Bae DS, et al. Fabrication of liquid phase sintered SiC materials and their characterization. Fusion Eng Design. 2006;81(8-14):963-7. Suyama S, Kameda T, Itoh Y. Development of high-strength reaction-sintered silicon carbide. Diamond RelMater. 2003;12(3-7):1201-4. Huang ZR, Liu GL, Liu XJ, et al. Manufacture of large-scale lightweight SiC mirror for space. ProcSPIE. 2012;8335:83351R. Robb P,Charpentier R,California PA. Three-mirror anastigmatic telescope with a 60-cm aperture diameter and mirrors made of silicon carbide. SPIE.1995;2543:185-9. Shen XM. Study on the Mechanism in Oxidation Assisted Polishing of Reaction Bonded Silicon Carbide Optical Parts. Changsha: NatUniv Sci Technol. 2014:87. Shen XM, Dai YF, Deng H, et al. Comparative analysis of oxidation methods of reaction-sintered silicon carbide for optimization of oxidation-assisted polishing. Optics Express. 2015;22(21):26123-35. Deng H, Yamamura K. Smoothing of reaction sintered silicon carbide using plasma assisted polishing. Curr Appl Phys.2012;12(3):S24-8. Shimozono N, Shen XM, Deng H, et al. Figuring and Finishing of Reaction-Sintered SiC by Anodic Oxidation Assisted Process. Key EngMater. 2015;625:570-5. Song Y, Dhar S, Feldman LC, et al. Modified Deal Grove model for the thermal oxidation of silicon carbide. JApplPhys. 2004;95(9):4953-7. Shen XM, Dai YF, Deng H, et al. Ultrasmooth reaction-sintered silicon carbide surface resulting from combination of thermal oxidation and ceria slurry polishing. Optics Express. 2013;12(21):14780-8. Yamamura K, Yamamoto Y, Deng H. Preliminary study on chemical figuring and finishing of sintered sic substrate using atmospheric pressure plasma. ProcCIRP. 2012;3:335-9. Shen XM, Tu QZ, Deng H, et al. Mechanism analysis on finishing of reaction-sintered silicon carbide by combination of water vapor plasma oxidation and ceria slurry polishing. OpticEng. 2015;54(5):055106. Lilov SK. Anodic oxide films on silicon carbide. CrystRes Technol. 2007;42(11):1054-7. Jiang GL, Shen XM, Tang J, et al. Oxidation Characteristic and Machining Performance of Reaction-Sintered Silicon Carbide Ceramic in Anodically Oxidation-Assisted Polishing. IntJElectrochemSci. 2016;11:1512-29. Seki H, Wakabayashi T, Hijikata Y, et al. Characterization of 4H-SiC–SiO2 Interfaces by a Deep Ultraviolet Spectroscopic Ellipsometer. MaterSciForum. 2009;615-617:505-8. Tu QZ, Shen XM, Zhou JZ, et al. Efficient processing of reaction-sintered silicon carbide by anodically oxidation-assisted polishing. OpticEng. 2015;54(10):105113. Deal BE, Grove AS. General Relationship for the Thermal Oxidation of Silicon.JApplPhys. 1965;36(12):3770-8. Shen XM, Tu QZ, Deng H, et al. Comparative analysis on surface property in anodic oxidation polishing of reaction-sintered silicon carbide and single-crystal 4H silicon carbide. ApplPhysA. 2016;122:354. Peng WQ, Guan CL, Li SY. Material removal mechanism of ceria particles with different sizes in glass polishing. OpticEng. 2014;5 3(3):035104.